I am so excited to tell you about Stampin' Up! 's new product, the Stamparatus! What is a Stamparatus, you ask? The Stamparatus, is a one of a kind stamp positioner tool. Reserve yours beginning November 16 at 2pm MST until Nov 30th or while supplies last. Your credit card is needed to reserve but will NOT be charged until it ships February 1. If your Stamparatus is shipping in February or March any product you add to your order will earn you 1 Sale-a-bration item!!! As a demonstrator, I am allowed to reserve up to 3 Stamparatus Tools during each reservation window. Want to order more than one on November 16th? Talk to me about joining! A: Normally you order Stampin' Up! products through the online store; in this case, you will click the RESERVE link on the Stamparatus page which will take you to the reservation page. 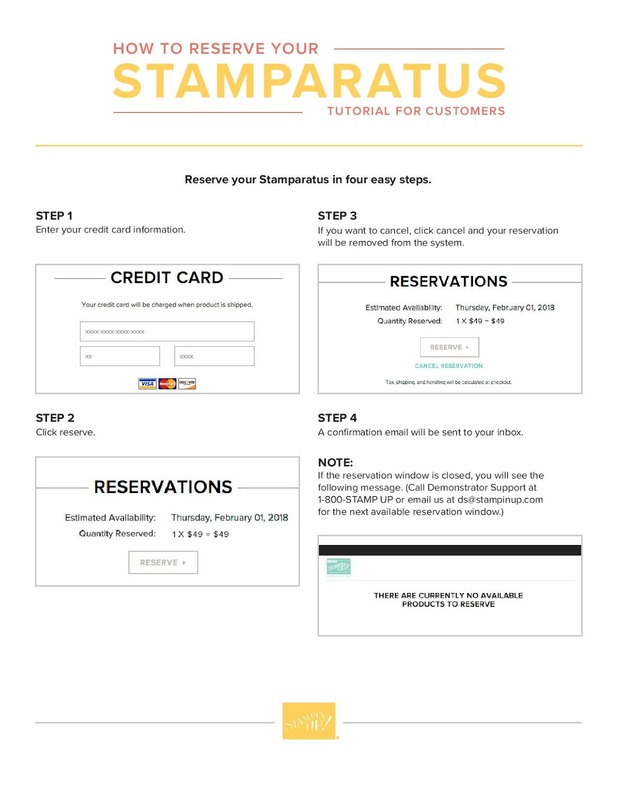 For step-by-step instructions, please see the "How to Reserve Your Stamparatus Tutorial for Customers" below. Q: What if I do not have a Stampin' Up! customer account? A: We will place an order with the manufacturer based on how many reservations are made during a reservation window. Shipping dates depend on how long it takes the order to arrive in our warehouse after the tools have been manufactured. A: No. However, once your reservation is transferred to your shopping cart, you will then be able to addother items to your order. Important note: Please do not delete the Stamparatus from your order. Wewill not be able to add it back and you will lose your reservation. Q: Will I be able to update my address and credit card information when I open my shopping bag tocomplete my order? Q: When I close my order, can I take advantage of current Stampin' Up! promotions? A: For customers, there is a limit of 1 per reservation window. For demonstrators, we can reserve 3… so want more than 1? - talk to me about joining before the 16th of November. So excited to hear from you about this new opportunity!